Enjoying a 50-year pedigree, the Bella 600R was spotted at the Sydney International Boat Show by our own John ‘Bear’ Willis and is sold through Chapman Marine. According to spokesperson Dan Hanoumis, the fibreglass all-rounder features a centre console, rub rails all-round and rides on the same hull as the 2018 European Powerboat of the Year. It’s one of three new models breaking bad at the NSW dealership, which also includes an alloy-fibreglass hybrid bow-rider and the all-weather Flipper with ‘sport top’. Check out John’s remarkable interview for the full details. Edencraft reimagines its 7.1m flagship Formula 233 in a hard-top Platinum combination. Aboard the newly-released hard-top, John ‘Bear’ Willis and Ben Joshua talk turkey on testing, fishing and the Formula 233’s capability out in the open seas. “We’ve spent a lot of time in it, we wanted to make it right … we realised we made the right decision,” says Ben. Although built to withstand commercial use, the Formula 233 is ideal for recreational fishing. And in a showtime first, punters could inspect all four variants at the Sydney Boat Show, encompassing hard- and soft-top versions of the Classic and Platinum specifications. Who says you can’t buy true love? Reel Bling, nicknamed ‘the fiance’, is a gorgeous custom 6m Edencraft masterminded as a wedding gift by one dedicated bride-to-be. If features on-trend lining and a stylish deck, quality fittings as well as spectacular pole holes with their own history. On show at the Sydney Boat Show, as inspected by our own John ‘Bear’ Willis, Reel Thing illustrates the craftsmanship coming out the Edencraft facility in Geelong. Bear chats to spokesperson Ben Joshua about Edencraft’s approach which, from all accounts, is anything but run of the mill. Join Bear to check out all the fuss. Keep the bait kicking aboard the fabulous 7.1m Edencraft 233 Formula Platinum with a pod mount option at the Sydney Boat Show. Our own John ‘Bear’ Willis inspects a soft-top variant with Ben Joshua from Edencraft, who reveals a key benefit to a pod design compared to the trans-mounted engine. As seen here, a whopping 500hp pushes it forward but a power upgrade awaits the spacious beast whose stability and ergonomics draw plaudits in rough waters. The 233 Formula is a perennial fisherman’s favourite but what can you expect from the latest Platinum fit-out? Versatility, says Ben. Join Bear and Ben on-board for a tour of the dash and the deck to find out more. Extreme Boats have been one of the Most Awarded Boats in New Zealand for the last 9 years and with quality design, construction and performance its not hard to see why. With models stretching from 5 metres to an Extreme 11 metres in length its easy to see how serious and passionate the team at Extreme are, and there’s good reasoning behind this. The boats are built by a team that fish and dive, so they have first-hand real-life experience on these boats. They don’t just build them to sell but are actually very passionate users of their own products which enables them to fine tune and adjust the designs to be very user friendly and most of all practical. Extreme Boats began manufacturing boats 20 years ago in small runs and have gone from strength to strength since. 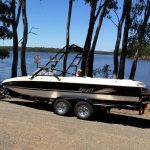 They build centre consoles, hardtop boats, sport fishing boats, side consoles and will also customise to suit any application at time of placing an order. Andrew from Queensland Marine Centre reveals the awesome power of the Mercury powered, quad rigged 1400 HP 42-foot Outrage centre console ballistic missile that’s every boaters dream. This boat for some is what’s considered downsizing from a 70 footer and there’s no doubt that the four 350HP Mercury Verado engines travelling at 50 MPH will get you to where you want fast. The Outrage lives up to its name and is a boat that is cross purpose, meaning it can be used for just about any activity like fishing, cruising, skiing or just for fun in complete luxury. Below deck, there’s a full cabin that sleeps four with toilet, shower, generator, air conditioning and all the comforts expected in a boat of this calibre. Boston Whaler is a name that’s been around for 60 years and there is an extensive range of models to suit just about any purpose. Check them out here. Australian built since 1946, the Cruise Craft brand has built a reputation for producing premium boats leading the industry in design excellence, innovation and quality. The all new Fish 360 M continues this trend with 360 degrees of unobstructed deck space ready to take your fishing to the next level. It has been a long time coming for this new release, but the extra time was taken to make sure it was perfect. Plenty of research and planning went in to create something Cruise Craft are really proud of. Centre consoles have been working really well in the Australian market, so Cruise Craft saw an opening to push that area. The Fish 360 M has the Cruise Craft DNA, based on an existing hull with an overall length of 6.35m, the striking presentation paired with great stability has not only met expectations through testings but gone above and beyond. 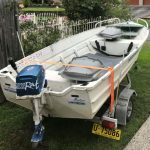 Standard inclusions are a Yamaha F150XB Four Stroke (Max 200HP), Custom Cruise Craft Trailer (Mech Brakes), 210L under floor fuel with dual fillers, hydraulic steering, dual battery system with VSR, self draining floor, over 700L of storage, built in 3 drawer tackle box, 4x cleats and 4x rod holders, a fire extinguisher, EPIRB and VHF Radio plus more. Cruise Craft have taken the time to make sure the F360M lives up to and exceeds the high expectations of their brand. The Crowne Series by Harris Boats are a pontoon boat with cutting-edge technology and supreme comfort. This flagship pontoon boasts luxurious design and detailing, premium construction and a range of amenities to allow you to entertain and enjoy recreational pursuits on the water as you would ashore. The Crowne SL 250 has a 350 HP Mercury Verado on the back and combines performance with luxury and versatility. Whether you want to waterski, cruise or fish, you can with the Harris Boats Crowne SL 250. With a license for 14 people, you can enjoy your time on the water with friends and family. In addition to luxurious, quality finishes combined with simple user-friendly features the Crowne SL 250 pontoon exceeds expectations for innovation, performance, luxury and styling. With over 60 years experience building pontoon boats, Harris Boats is one of the pioneering companies in the pontoon boat industry, accommodating to customer needs and requirements to ensure that you get the right boat for your application. Whether you prefer to be on the land or in the water, Pacific Marine & RV is the place to go. Specialising in their own boats that they have been making since 1991, as well as a great range of Swift and Roma Caravans, Pacific Marine & RV are the one stop shop for anything you need for a great weekend away. With a great range of on-road and off-road vehicles, boats as well as service and repairs, there is definitely a reason why Pacific Marine & RV is South Australia’s largest marine centre.